Steamboat Springs sits at a bend in the Yampa River in an area rich in natural mineral springs. Trappers called it the �Big Bend� and using the springs as a guide to Brown Hole, made reference to the �Bubbling Springs.� Ute Indians called it the �Medicine Springs� and, convinced that the waters had healing powers, summered in the area. The town takes its name from one of the springs � the only one that spouted water several feet into the air and out over the river, making a loud chugging noise reminiscent of the sound of paddles on steamboats on the large eastern rivers. History does not record who named either the spring or the town. Legend gives credit to three French trappers, one of whom is reported to have declared upon hearing the spring, �There�s a steamboat, by gar!� By the 1870s, trappers, explorers and miners passing through the area referred to it as Steamboat Springs. James Harvey Crawford, the town�s founding father and first permanent settler, moved his family from Missouri to Colorado in 1873, settling at what is now Hot Sulphur Springs in 1874. On a hunting expedition that fall, Crawford and six others followed the Gore hunting party�s trail into Egeria Park (Yampa area now) where they met a trapper who described the wonders of the Yampa Valley. Not completely satisfied with his claim at Hot Sulphur Springs, Crawford urged the group to explore the valley. Crossing Twentymile Park, they proceeded as far as the present site of Craig where Crawford staked a claim. Disappointed that he had missed the Steamboat Spring, Crawford and a companion risked dangerous travel through steep canyons on the return trip to find it. The site was so appealing that Crawford immediately staked a claim by burning the side of a quaker tree which stood near the Steamboat Spring until the railroad was forced to remove the tree in 1910. Crawford brought his family to Steamboat Springs in July 1875 and built the first cabin on the banks of Soda Creek. But stories about the area spread, and by the end of summer five other families had built cabins around the springs. It was not until 1876 that Crawford obtained the patent on his claim, after paying a legal survey and convincing a government agent that the springs had no value. Between 1875 and the early 1880s the Crawfords were the first permanent settlers. While other families came and some even staked claims, most left during the winters. It was the Crawford home that served as a fort for Hayden and Yampa River settlers during Indian scares in September and October 1879 following the Meeker Incident (aka Meeker Massacre). Transportation problems and fear of Indian reprisals which never materialized slowed growth in the area. Less than a dozen families lived in the region by 1878 when James Crawford was commissioned as Steamboat�s first postmaster to facilitate occasional mail service between Steamboat Springs and Hot Sulphur Springs. Travel was by horseback in summer and by snowshoe in winter. The first sign of growth came in the summer of 1883 when H.H. Suttle brought a sawmill to Steamboat Springs. With the capacity to produce logs for homes and stores, development was assured. In the fall of 1883, 16-year-old Lulie Crawford began teaching school for 13 students in a small log cabin. A school district was organized in 1884, the fourth in Routt County. The following year, Crawford and a group of investors from Boulder raised $160,000 and formed The Steamboat Springs Town Company. James P. Maxwell laid out the town, most of it on the William G. Mellen claim, southeast of the original Crawford claim, later known as the Crawford Addition. Businesses: One of the first businesses to open in the new town was a newspaper, The Steamboat Pilot, under the ownership of James Hoyle, printed its first edition on July 31, 1885. By 1886 the business district included a general store, post office, and hotel. The Town Company opened a bathhouse built over one of the hot springs on the east end of town where soap and towels were supplied for a slight charge. In 1887 the town�s first doctor, John A. Campbell, a combination physician and preacher, began providing unlicensed and uncharged aid and comfort to the community. The town remained isolated. Roads were trails open only in summer, and the closest railroad was 160 miles north at Rawlins, Wyoming. Doors did not open until 1888 when the Denver and Rio Grande Railroad reached Wolcott, 75 miles south. At first access was provided by a stage line from Wolcott to Rock Creek which met another stage line to Hot Sulphur Springs, but in 1889 D.W. Whipple and F.E. Milner obtained a mail contract and began making three trips a week to Wolcott. With a road to Wolcott open, freight wagons began hauling goods into the area to supply the region. In 1888 Henry Schaffnit Sr. built the Sheridan Hotel, the first real hotel in northwest Colorado. Groesbeck and Metcalf opened a drug store. By 1889 the Reverend J.W. Gunn had formed a Congregational Church Society, F.E. Milner had opened a store and bank, and the town had built a bridge across the Yampa River. A second newspaper, The Inter-Mountain, began publication but after several changes in ownership merged with The Pilot. As huge cattle outfits gave way to smaller ranches that raised cattle and grain, real estate became profitable and the 1890�s were marked by incredible growth. A flour mill was built in 1890. The two-story Union School was erected on Pine Street to house primary and intermediate grades in 1892. Construction began on the Congregational Church, the first church in town. A volunteer fire department in 1897 began raising funds, although the first truck, a Model T Ford, was not purchased until 1921; the first real truck arrived in 1937. The turn-of-the century brought change to Steamboat Springs. 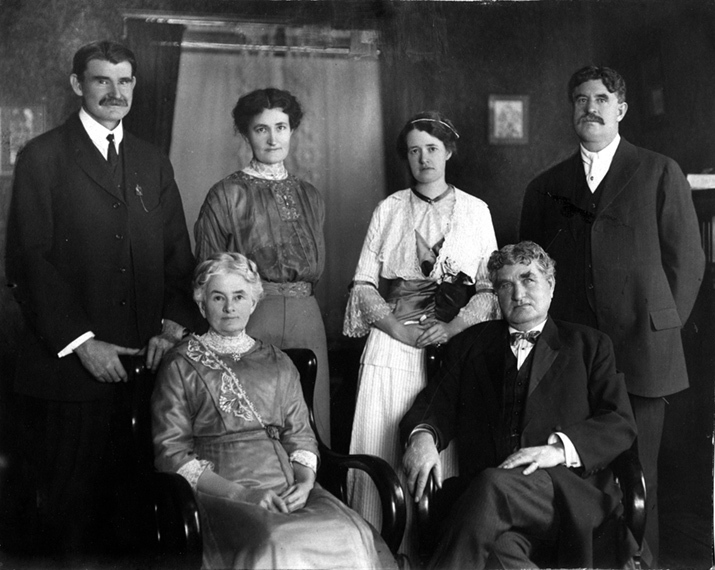 In August 1900, the town incorporated and James Crawford was elected the first mayor. The Western Telephone Company, a J.W. Hugus enterprise, put in a telephone line for the primary purpose of connecting their stores to the outside world. A few years later, Colorado Telephone bought the line, and expanded phone service throughout Routt County. They later sold to Mountain Bell. Don, Walter, and Norman Carver began operating an electric Power plant in the brick building still standing at Tenth and Oak Streets (now the City of Steamboat Springs' Centennial Hall)and steam from the plant was piped underground to heat the school at Seventh and Oak Streets. Houses all along the route subscribed to the system for heat, and children played marbles all winter along streets cleared of snow by the underground pipes. By 1902 Steamboat Springs boasted two hotels (The Sheridan and Onyx), two newspapers (The Steamboat Pilot and The Routt County Sentinel), three livery stables and blacksmiths, three banks, four general stores, two meat markets, a harness and saddle shop, and numerous small businesses. F.M. Light & Sons opened in 1905, serving customers in Wyoming and Utah as well as northwestern Colorado. By 1902 John Trull was driving around town in the first automobile, and in 1909 the city sewer became operational. The biggest change came when the Denver, Salt Lake and Pacific Railroad finished laying the rails into town on December 18, 1908. On January 6, 1909, the first passenger train arrived, making tourism an integral part of the local economy. The town responded immediately, planning 15-foot sidewalks on both sides of Main Street. The Bath House was elegantly remodeled to include a 110 x 190 foot outdoor pool built from native stone and a 75 foot long indoor pool fed directly from a hot spring; a large building housed separate dressing rooms for men and women, and ten small private pools and steam rooms. The greatest investment to accommodate the tourist was the Cabin Hotel built in 1909 on the site of the present Bud Werner Memorial Library. 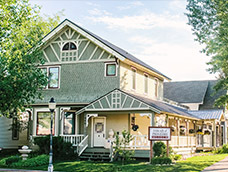 The 100 guest rooms, dining room, two parlors and central heating earned it the reputation as the best hotel in northwest Colorado. But despite a rustic atmosphere, striking big game heads and plush upholstery, business floundered in the 1930�s. On January 24, 1939, the hotel burned to the ground in under an hour, taking two lives. Deeds issued by The Steamboat Springs Town Company prohibited the making and sale of spirituous liquor and the town was dry. Because this did not sit too well with cowboys from local ranches, a small community developed on the south bank of the Yampa to accommodate those who wished to imbibe. The area was dubbed Brooklyn by residents of Steamboat Springs who considered it the �red light district.� As many as forty persons lived there during its heyday between 1902 and 1914. Brooklyn consisted of one unnamed street, running from the river south to the hillside, lined with saloons. The first saloon opened in 1898 and was quickly joined by four more. Among the best known were Shorty Anderson�s, Fred Cheetel�s and The Capitol where no women were allowed. Hazel McGuire�s was reportedly the leading parlor. Despite the booze and the ladies, residents from all over the county went to Brooklyn where they camped along the Yampa during the rodeo and Strawberry Festival celebrations. The only liquor available outside Brooklyn was served at Dunfield�s Saloon located where the stock bridge joins U.S. 40. It was distinguished by the fact that an overindulgent patron was found frozen to death one morning in one of the creeks that forms Dream Island. Changes in the state liquor laws and efforts by Steamboat Springs residents to clean up the area closed all the saloons by 1914. Situated on the south side of the Yampa River directly across from town, the hill was first used for jumping in 1915; slalom and downhill courses were not added until the late 1930s. The first tow, built in 1934, was a �boat tow,� two sleds pulled by a cable powered by a car motor and transmission. It served until 1970. The lift to the top of Emerald Mountain, built in 1947, was one of the longest in the United States. During the 1950s a 90-meter jump was built and named for Douglas Graham, a local businessman who contributed both time and money to the hill. 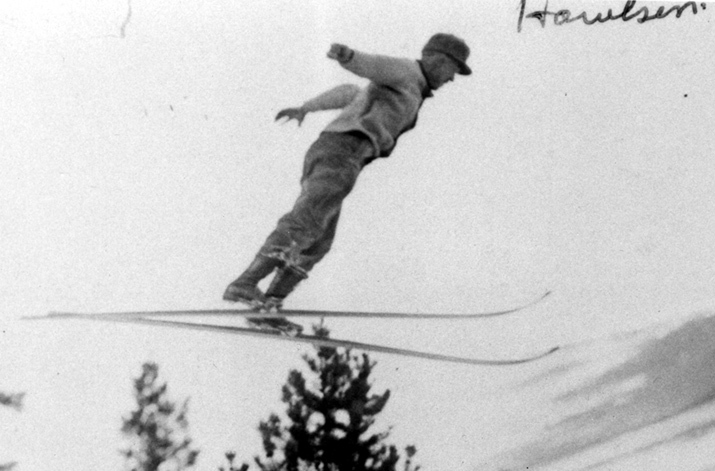 The Graham Jump attracted many Olympic training ski camps and was the site of several noteworthy jumps, incuding Asten Samuelson�s 316 foot jump in 1951 which set a record that stood until 1960. The Graham Jump burned in 1972 and fund-raising efforts for a jumping complex were launched the next year. Construction on Olympic-style 90, 70, 60 and 30 meter jumps began in 1976 and was completed in 1978. St. Paul�s Episcopal Church (1913) and the Christian Science Church (1934) are still using original buildings. The Holy Name Church (1911) and Methodist Church (1902) occupy newer buildings on their original sites. The Congregational Church built in 1893, moved to a new location after the original church was destroyed by fire. In the summer of 1876 Jeannie Bennett opened the town�s first school in the Crawford family living room for Lulie and Logan Crawford. The Steamboat Springs School District, organized on August 25, 1883, built a one-room log cabin on Soda Creek next to the Crawford house. Lulie Crawford was its first teacher. The first school contracted with public funds was a two-story building called the Union School which stood on Pine Street just south of the present Junior High School. It housed all grades from 1890 to 1897 when high school classes were added to the system. To provide room for the high school students, the first grade moved to a log cabin at Sixth and Pine Streets; the second grade moved to the Denison Library just west of the Union School; and the third grade went to the stone house still standing on Sixth Street. The Union School, which burned in 1910, was replaced in 1911 by a three-story brick building facing Pine Street which housed all students until a high school was built in 1918 directly behind it facing Seventh Street. In 1951 the high school bought an adjacent building which had housed the hospital for 30 years for use as a band room. The Soda Creek Elementary School was built in 1956, leaving junior high students in the Pine Street building and high school students in the Seventh Street building. In 1965 the present high school was built near Wither Hill, with classes starting in the fall. Junior high students moved into the Seventh Street building. The Pine Street building was torn down in 1967. Population increases forced additions to the high school in 1972 and the elementary school in 1960 and 1974, and more in more recent years. The Crawfords first provided postal services out of their log cabin in the summer of 1878. Mail arrived weekly by snowshoe until 1892 when the stage began to come daily. In 1888 the post office moved to Charlie Baer�s sport shop next door to Harwig�s, and in 1908 it moved to the Maxwell Building at Ninth Street and Lincoln Avenue where it remained for 54 years. The post office moved into a new building at the west end of town in 1962. Built at 1184 Crawford Avenue in 1893 of stone from a local quarry, the house served as the Crawford family third home in town until Mrs. Crawford�s death in 1939. The first family is buried in the Steamboat Springs Cemetery. The small log cabin at Sixth and Pine Street was moved to Casey�s Pond on the east edge of town where it was used as the Chamber of Commerce Information Center since 1978. It was built on Pine Street in 1897 to house first grade classes after the Union School became overcrowded. Instituted by Carl Howelsen in 1914, this annual community festival, held in the second weekend in February, features slalom, downhill, cross country and jumping events at Mount Werner and Howelsen Hill, and unusual riding and ski events on Lincoln Avenue. The first carnival included cross-country races and jumping events on Woodchuck Hill where the local college now stands. 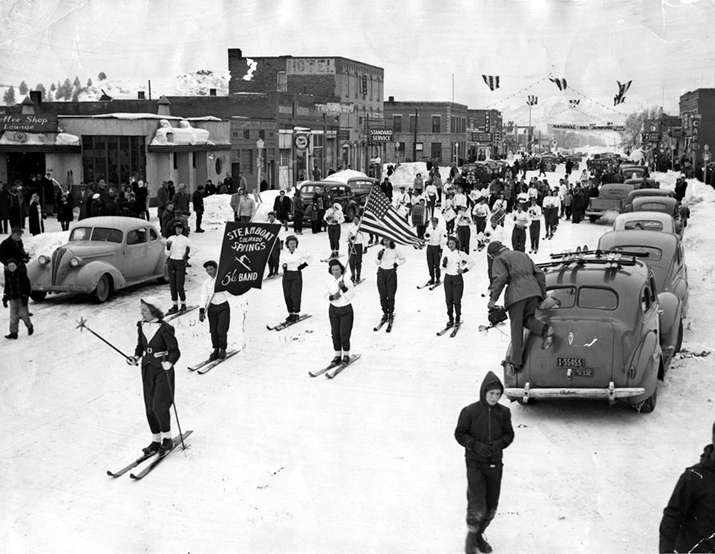 Among the special attractions that have been added through the years are a street parade featuring costumed skiers towed by ropes in the shape of diamond hitches; racing horses pulling skiers who jump hurdles and spear hoops in ski joring events; and the Steamboat Springs High School Marching Band on skis, the only band of its kind in the nation. In 1935 slalom and downhill races and jumping events were added. In 1936 the �Lighted Man� � Claudius Banks descending the hill with 100 pounds of battery-powered ashing lights and roman candles � was added to the tradition. During the 1940�s, a night show featuring skiers carrying flares and fireworks and jumping through flaming hoops became part of the carnival. Since James Crawford sponsored the first Fourth of July celebration in 1876, a parade, picnic, fireworks display and rodeo have become traditional events. The first celebration was attended by a few settlers and Ute Indians who held a picnic and a flag raising. As the community grew, festivities were expanded to include a parade, speeches by leading citizens and a big dance. The first bucking events were added on July 4, 1904, on the flats across from Dream Island on the south side of the Yampa River. 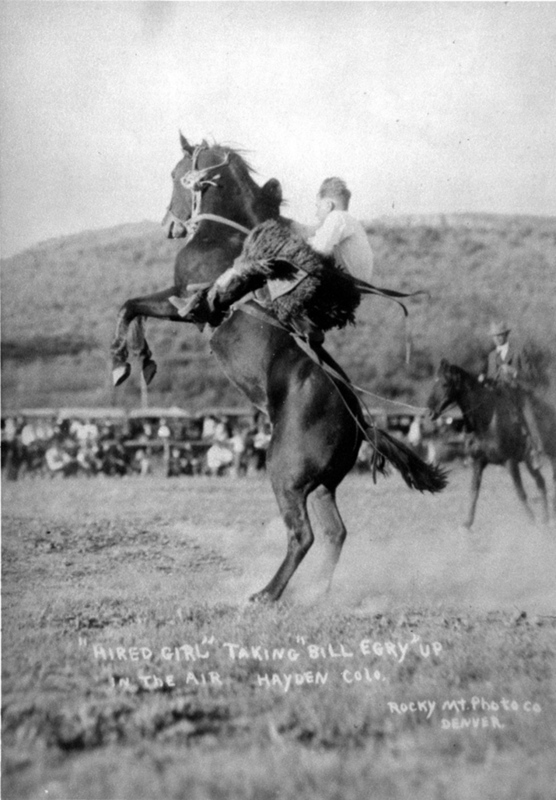 Because Steamboat Springs was headquarters for a large cattle industry, there were several rodeos held throughout the summer. When the railroad arrived, the rodeo grounds were moved to the outskirts of Brooklyn where the rodeo is still held. The first permanent rodeo arena was built in 1927, and rodeo became a regular part of the July Fourth celebration in 1929. The American Legion ran the events from the 1930s through the 1960s, and started doing the fireworks displays in the late 1940s. Cutter races, first held in the Yampa Valley in 1957, began as a winter event featuring cutter sleighs pulled by teams of specially trained horses. Since 1974 the Steamboat Springs Council of the Arts and Humanities has sponsored a weekend �Art in the Park� festival every summer.